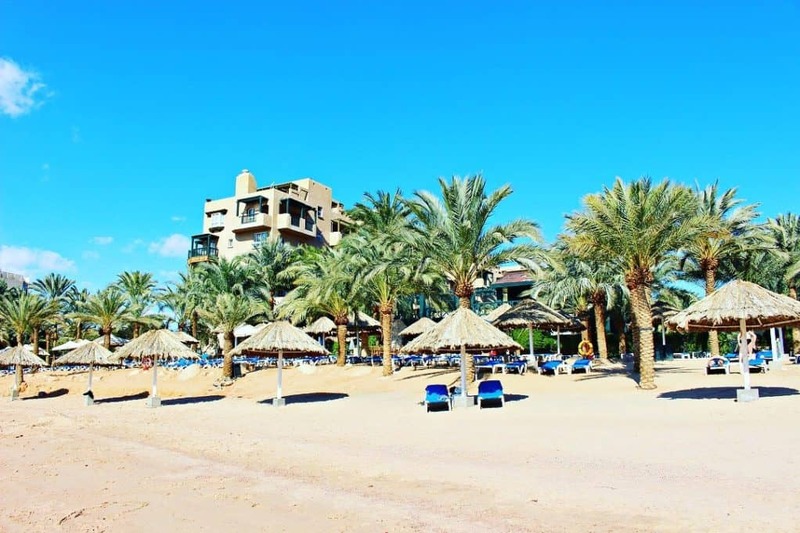 My Movenpick Resort and Residences Aqaba Review. Where to go for some winter sunshine? You want to stay in a great hotel, enjoy beautiful private beaches,snorkelling and diving? Only 5 hours from Europe it is easy to get to Jordan. It is a great choice for a year round holiday, flights are not expensive and the hotel prices for quality 5 star hotels are unbeatable. Aqaba is a good choice as a destination alone or as part of a tour around Jordan. Movenpick Resort and Residences Aqaba review. 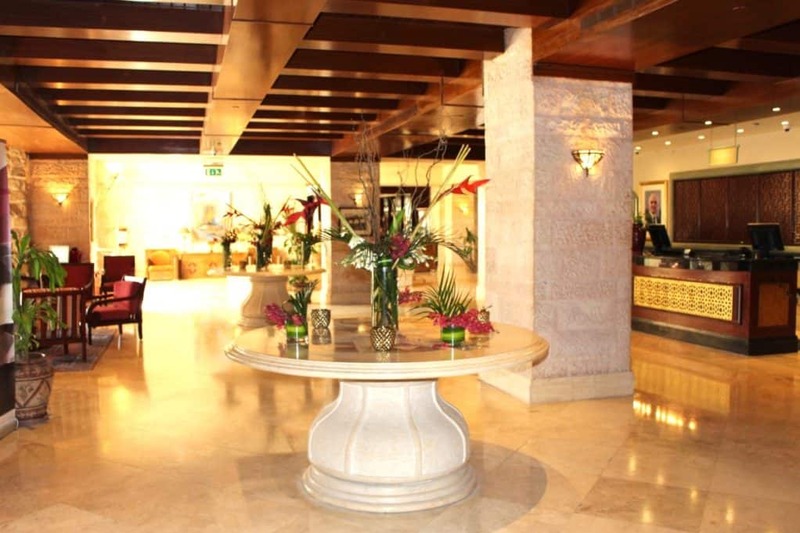 Movenpick have 2 hotels to choose from in Aqaba. Movenpick Resort and Residences Aqaba, situated in the town by the sea in Aqaba. Movenpick Tala Bay Resort is about 10 minutes drive away from town. I stayed at the first and enjoyed a wonderful stay. 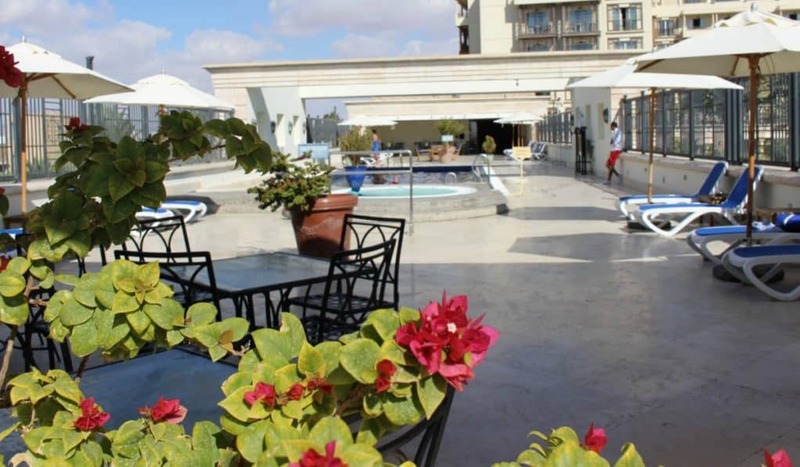 The hotel is located in downtown Aqaba so you just step out of the door to explore the city. The airport is only 10 km. Regular readers will know this is my second visit to this lovely country in just 2 months! 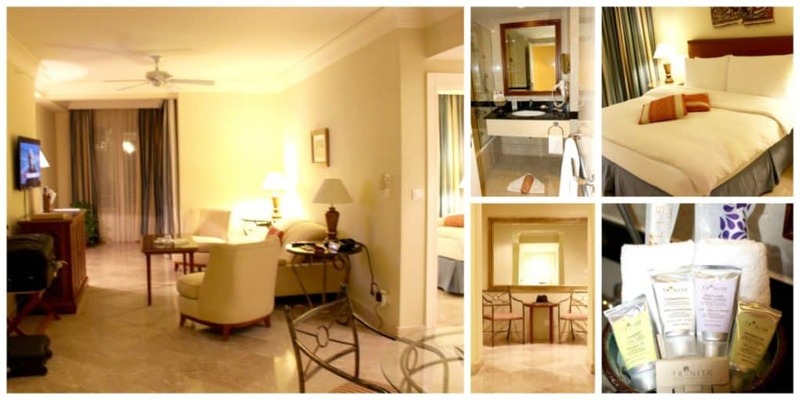 Movenpick hotels in Jordan are all delightful places to stay and I recommend them to my readers. Movenpick Resort and Residences Aqaba is no exception. 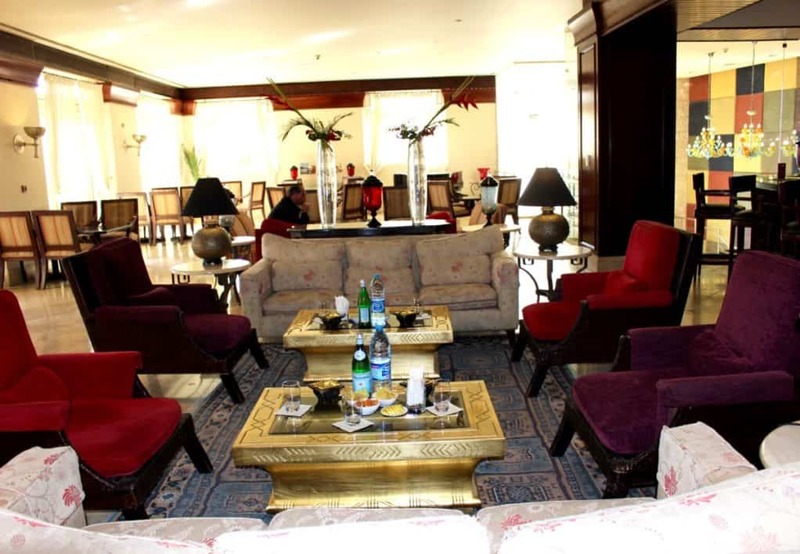 The hotel is beautifully decorated, the rooms stylish and comfortable. 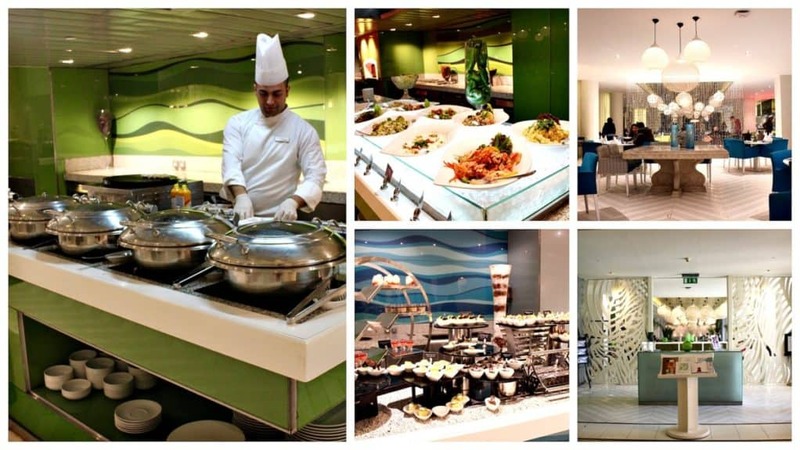 All of the staff at Movenpick hotels are always a delight and this will make your stay extra special. I love the warm and welcoming interior design with traditional Jordanian decor including soothing water features, comfortable sofas and an air of tranquility and calm. I stayed in Suite 646 and it was super comfortable with a living room, bedroom 2 bathrooms and even a kitchen! The Suite looks out over the beautiful Red Sea. A Nespresso Machine, tea, coffee and Mineral water are complimentary. The generous selection of Dead Sea bathroom products and every little thing you could possible need all make a stay very comfortable. I particularly like the generous hanging space for my many clothes! I must learn to pack less one of these days! The most important Diva essential? A comfy bed! and this one did not disappoint, really good nights sleep. 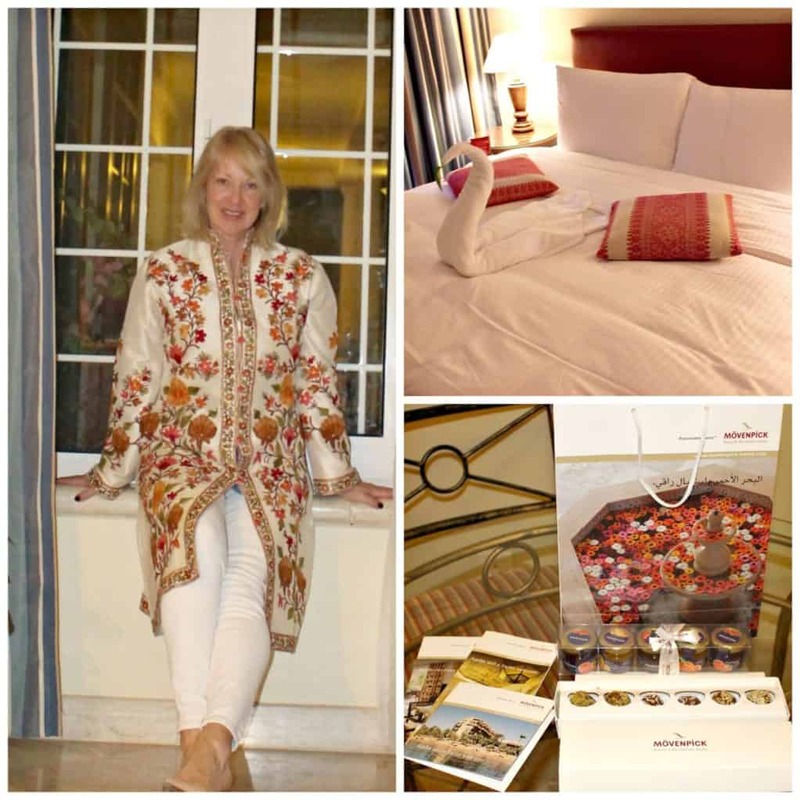 PHOTO: Enjoying my lovely suite and some Movenpick treats! Two long months since I have seen any sunshine, so it is a pleasure to enjoy the beach and Swimming Pools. January is wintertime in Jordan but it is perfect Springtime weather. Sunny days at about 24 degrees but the nights are chilly, so pack some warmer clothes for the evening. In summertime the hotel has 4 swimming pools open for guests, in winter just two pools and the beautiful private beach and Watersport centre. The beach is Blue Flag certified and spotlessly clean. Enjoy the rooftop pool too! or, get fit in the gym. I must confess to being very lazy and not trying out the gym, despite my best intentions! I must also try the sauna and Jacuzzi next time. I like to travel in low season, places are not crowded, hotel rates are low and the weather not too hot. If you like to travel in high season and have hot weather you should visit in summer. Then there is also a Watersports centre on the hotel beach which can arrange everything for you, from boat trips, speed boats, jet skis, water skiing and diving. The Kids Club is available to children. Enjoy delicious meals too! 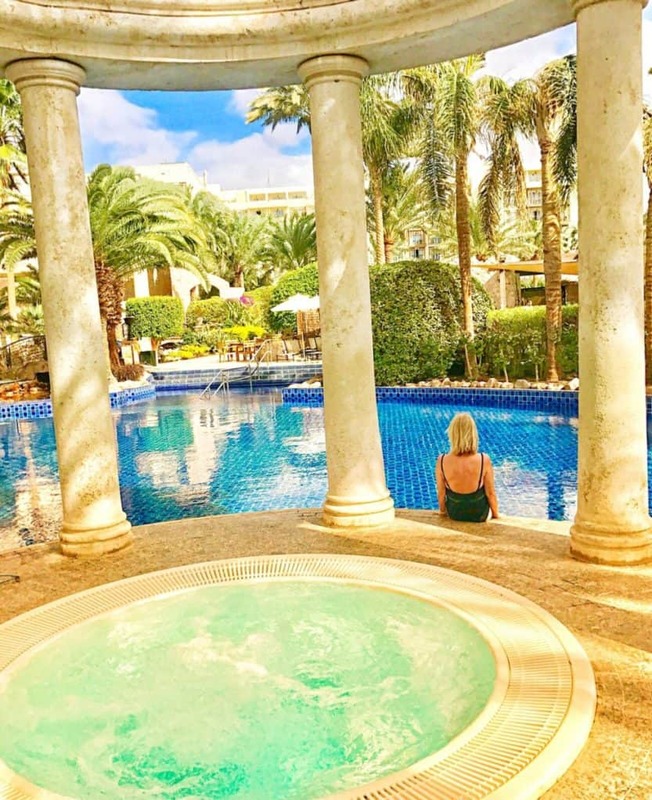 It is impossible not to find something you want to eat in the Palm Court Restaurant with a huge buffet selection of tasty dishes from around the world, or a la carte dining if you prefer. I like the fact that it is open from 6.00 am for breakfast until 10.30 am then again for a long lunch til 3.00 and dinner in the evening , so just choose to eat whenever you want through the day , rather than having to stick to strict times! The terrace at Palm Court Restaurant is gorgeous and nice for lunch. In summer the perfect location for dinner too. I really enjoyed every meal! Lots of healthy options too. The Head Chef has worked here for a long time and runs the kitchen superbly producing a wonderful choice of dishes. There is a lovely Restaurant Cafe called Al Shatt down by the beach. A great chill out vibe and delicious food again! All of the staff are so lovely, helpful and friendly! Here I am, above, with the chef at Al Shatt and some of the staff. They even carried an umbrella for me as I burn within seconds in the sun! 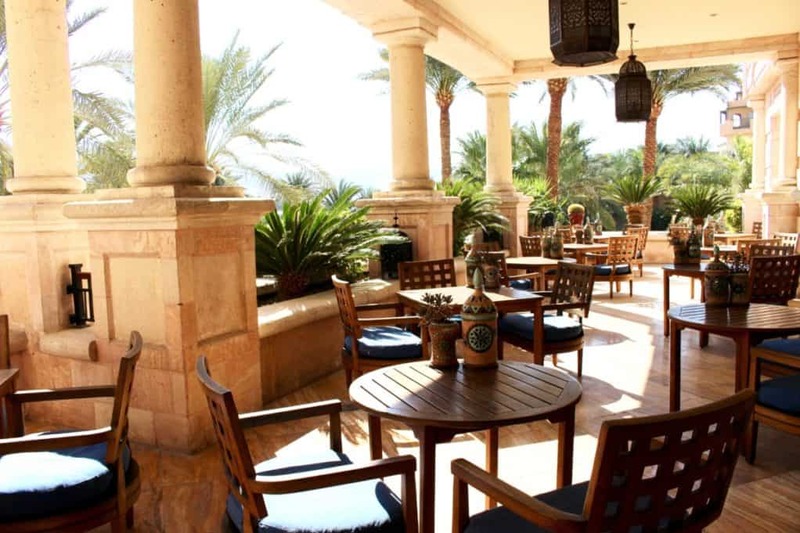 Also make sure to visit the very cool bar Al Nafoura Bar and Terrace next to the lobby. 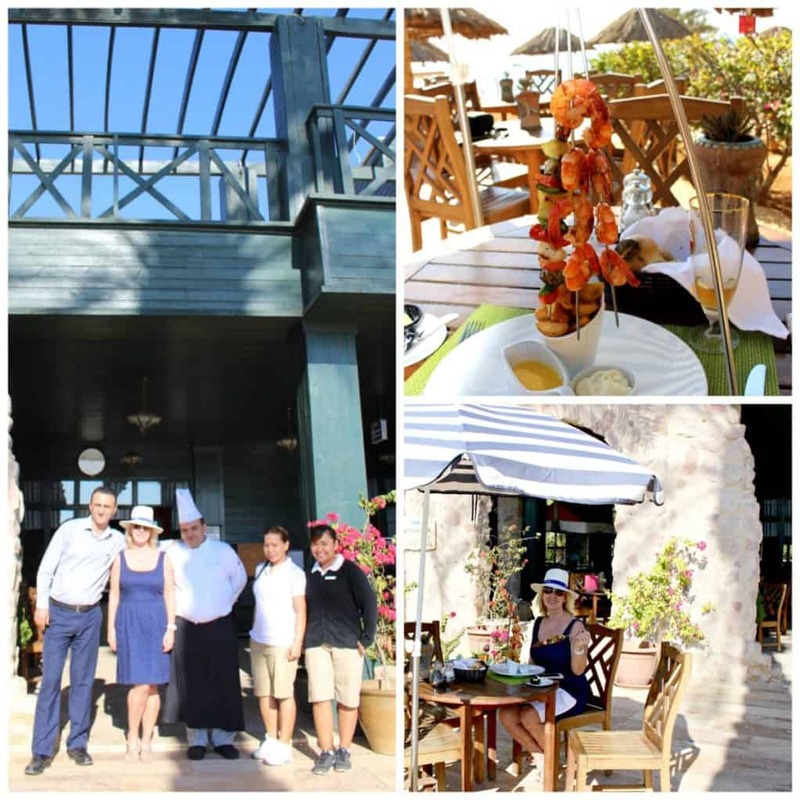 Enjoy drinks or something to eat at Al Nafoura Bar and Terrace. How lovely is this terrace above? You will not get bored at Movenpick Resort and Residences Aqaba, there are no less than 8 restaurants to choose from including Abu Nawwas Fun Pub with live music every night. There is even a delicious Bakery Shop and Cafe to visit! 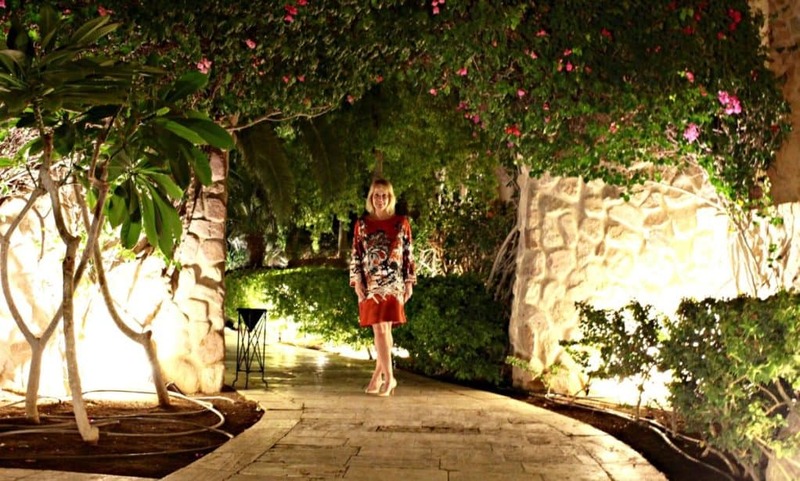 Every Movenpick I have visited in Jordan has the most exquisite gardens and it is a pleasure to stroll through the gardens and enjoy the flowers. This hotel is Green Globe certified and has won numerous awards. The hotel is based downtown, so you can just step out of the door and explore. I was travelling alone and always feel very safe wherever I go in Jordan. Jordanian people are friendly and welcoming to guests. You can walk around town directly from the hotel. There are a lot of local bars and restaurants everywhere in town. I hope my Movenpick Resort and Residences Aqaba Review is helpful to you. Do contact me if you want to know anything else or need more information. Aqaba has lots of interesting Spice shops and everything else you can imagine to buy. I particularly like the Jordanian embroidery on scarves and clothes. A Bedouin coat is on my wishlist for next visit! 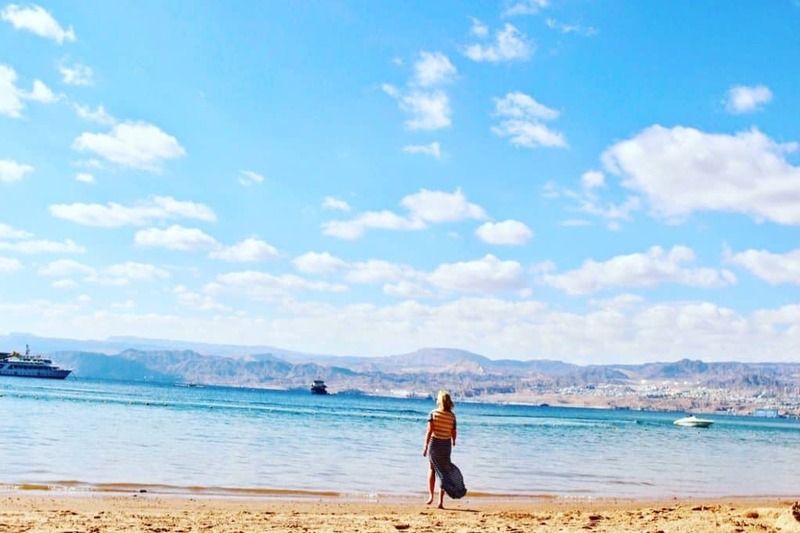 If you plan on taking a tour around the country and visiting other areas in Jordan, check out my blog posts on Dead Sea Jordan and Petra. The hotel is smart casual as one would expect. You can wear whatever you like in the resorts. However, I always dress a little more conservatively when out and about and tend to cover my chest and arms more than normal. It is a conservative country and most Jordanian women are covered. A shawl to keep warm is also a good idea. Read my review about my Zara Spa in the sister hotel Movenpick Taba Bay Resort and Spa. I hope my Movenpick Resort and Residences Aqaba Review is helpful, email me with any questions! Next Post Naturist Beaches South of France – Skinny Dipping!